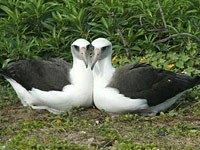 Albatrosses, are large seabirds. They range widely in the Southern Ocean and the North Pacific. They are absent from the North Atlantic. Albatrosses are amongst the largest of flying birds. Albatrosses use their formidable wingspans to ride the ocean winds and sometimes to glide for hours without rest or even a flap of their wings. They also float on the sea's surface, though the position makes them vulnerable to aquatic predators. Albatrosses drink salt water, as do some other sea birds. 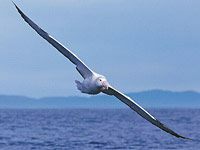 Albatrosses are highly efficient in the air, using dynamic soaring and slope soaring to cover great distances with little exertion. They feed on squid, fish and krill by either scavenging, surface seizing or diving. What is the difference between a seagull and an albatross? There are some fundamental differences in anatomy but the simplest and most obvious differences are that albatrosses specialise in feeding on marine creatures that they catch themselves; gulls are opportunist omnivores. 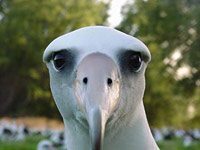 Albatrosses also have a adaptation to remove salt from their diet that allows the salt to be excreted from glands in their nostrils. 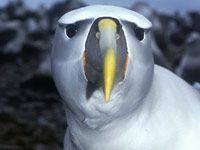 How many types of albatrosses are there? The albatrosses comprise between 13 and 24 species (the number of species is still a matter of some debate, 21 being the most commonly accepted number) in 4 genera. 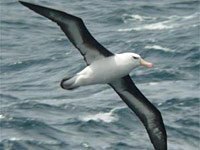 The four genera are the great albatrosses, the Mollymawks, the North Pacific albatrosses, and the sooty albatrosses or sooties. Of the four genera, the North Pacific albatrosses are considered to be a sister taxon to the great albatrosses, while the sooty albatrosses are considered closer to the Mollymawks. 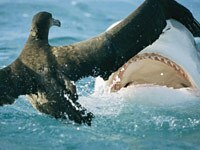 What does an albatross eat? The albatross diet is predominantly cephalopods, fish and crustaceans, although they will also scavenge carrion and feed on other zooplankton. It should be noted that for most species, a comprehensive understanding of diet is only known for the breeding season, when the albatrosses regularly return to land and study is possible. The importance of each of these food sources varies from species to species, and even from population to population; some concentrate on squid alone, others take more krill or fish. Of the two albatross species found in Hawaii, one, the Black-footed Albatross, takes mostly fish while the Laysan feeds on squid. Download free Albatross wallpapers, click on the image to open the large version. Print free Albatross coloring pages, click on the image to open the large version.